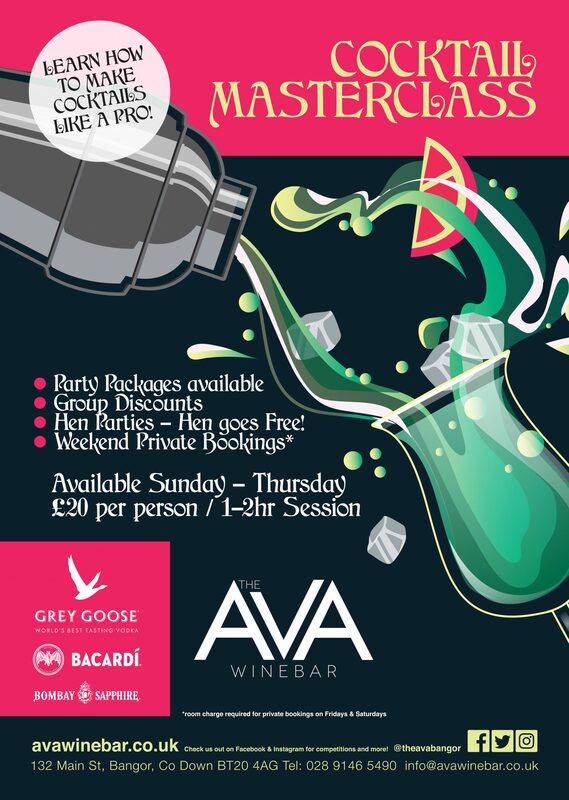 I recently sat in on one of The Ava’s Cocktail Masterclasses, a newly added option in their private hire section. Felipe was hosting a tailored class for Facebook competition winners, I definitely didn’t want to miss out so I tagged along; to blog a bit about the experience, of course, but also… cocktails. The aim of the Facebook competition was to promote The Ava Blogger; a blog dedicated to all things ‘Ava’ right here on the Bistro’s website (yes they gave us a little creative corner!). 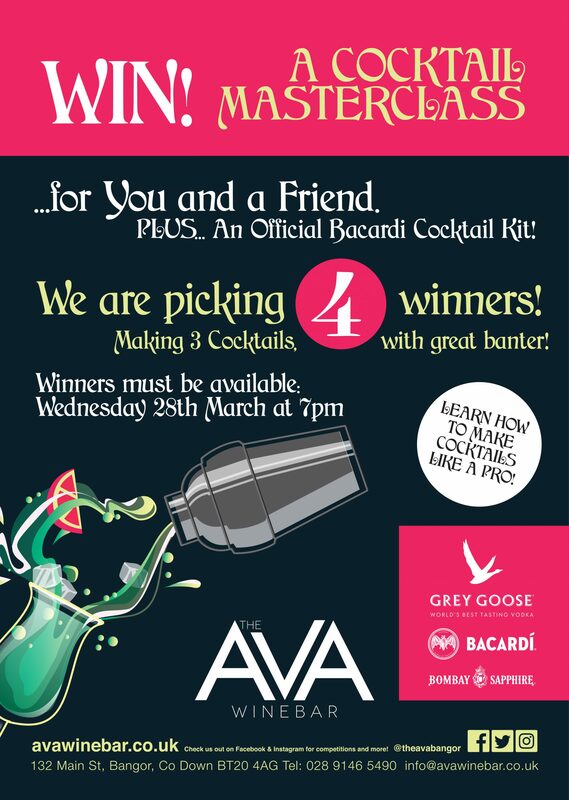 The online competition was posted on Facebook, giving customers the chance to win a Bacardi branded high spec Cocktail Kit and a Masterclass ticket for them and a friend. Free alcohol, and in the delicious cocktail form, why would you not?! The competition post asked customers to like their page and share any blog link from The Ava Blogger, 3-4 clicks and the job was done. The blog is posted monthly so there were around 6 posts to choose from, topics varying from Food and Drink recipes to The Ava’s offline activities. P.N For any enquiries please send us an email or get in touch via Facebook. I arrived around 5 minutes before the class was due to start, the bar was full of competition winners with just a couple more to come. Guests were greeted with a drink on arrival, Liquid Gold, a cocktail from the Mixologist’s Choice section in The Drinks Bible, made with Jawbox Gin, Prosecco, Ginger Cordial and honeycomb. Everyone sat around the Monkey Puzzle bar in the upstairs Bistro, a bright and well lit room, with an impressive back bar for such a little unit, the perfect size and backdrop for an intimate masterclass. Everyone had a drink in their hand and I thought to myself, ‘good man Felipe’. I personally had never took part in a cocktail class of any kind before, I am not ashamed to say that I also worked in a bar for 3 years. The closest thing I made to a cocktail was gin and juice, and it was MAYBE served with a straw. So classy. I was young and basically if anything required a shaker I looked at my work counter-part like ‘are we doing cocktails tonight?’ which was code for, ‘are you making the cocktails tonight’. (I’m not even joking either, thank you Hans for saving me from many an unhappy customer that wanted their Margarita’s, oh wait, that could have possibly been me?!). A hello and welcome was made with a slight brief on the night and an explanation as to why everyone was here. The first couple were straight up, Felipe wasn’t messing around, it was Mojito time! Felipe worked the bar, giving each couple a one to one session. He liked to find out what they liked and disliked, then made guests make cocktails to reflect this. Trying to change the perception around flavours he went on to say that tastes are associated with memories, especially tastes that you think you do not like. Exploring different flavour combinations is all in the learning experience, sometimes you fail and make a stinker, but most of the time you end up making a delicious drink. For each cocktail Felipe broke down the drink; measure by measure, shake by shake and eventually finishing with a garnish and taste test. Guests fulfil the practical side while he guides them through the method. A popular comment made by the Head bar man was ‘You are in control of your own measures this evening’, I think everyone in the room took note of this, it’s not very often you get let loose around the other side of the bar or have control over the alcohol measures! Now, back to the Mojitos! These were a relatively easy cocktail to make as they required no real cocktail utensil, just LOTS of ice and a stirrer. This was a mixed bag response, with one of the women saying yes and the other slightly screwing her face This did not phase Felipe though! One made the classic French Martini with Raspberry Chambord and Pineapple Juice while the other Martini had a Parma Violet twist with Cranberry Juice. Both contained pasteurised egg whites, shaken and double strained. Unanimous decision to agree to disagree, each woman preferred her own! This is the cocktail we went to the Caorunn Gin Cocktail Competition finals with, it took place in the Titanic Hotel, unfortunately The Ava didn’t snag a win but we did create a rather good cocktail out of it. This cocktail contains; gin, liqueur and a Sharps Atlantic Pale Ale or Apple Juice. The couple Shake Shake and Tap (the old cocktail kit secret), followed by a taste test. Felipe explains that it is the citrus in the craft beer and reminds everyone on the size of the measure being just 25ml, so not enough to over power the drink, just to compliment it. Felipe: “What’s your favourite drink? Like what would you drink on a typical night out? So Felipe, what’s your story? I know you’ve all heard of a Strawberry Daiquiri (a Northern Irish Summer staple) but have you ever heard of a Pineapple and Cardamom Daiquiri?? Completely throwing off couple number 1 who were back up for their second cocktail of the evening. Felipe talks them through the process of adding sugar syrup (sugar syrup recipe can be found here) he passes everyone round his homemade, Blue Peter style bottle and everyone has a smell or taste, commenting that it tastes better than it smells. Once the cocktails are finished Felipe asked both partners to taste them to make sure they were 100% happy with their finished masterpiece. This resulted in one who liked theirs with no complaints and the other slightly pulling a face, not quite sure about his. Felipe- not a problem lets get it back into the shaker and add a bit of pineapple, this will take the edge off. Now, it should be a completely different drink, the guy has a look of disbelief on his face and completely agrees with Felipe, that it does indeed taste like a different drink! Girls promptly pour doubles… One pops the cocktail shaker open first go while her friend struggles, they exchange a bit of light-hearted banter about who was struggling now. A running theme throughout the night when it came to shaking cocktails was one person was unable to hit the shaker in the sweet spot to make it pop open, while the other would get it on the first or second try. Then the chips arrived. I have never been so happy to see chips, making cocktails is thirsty and hungry work you know! It was probably around cocktail number 3 where I thought to myself, should we put on food? Should this be an option? If I get food made will they eat it? And then, one of the competition winners leaned over to me and said, do you know what would be a perfect option for these classes? Your Tapas! With that I did a quick run downstairs with some empty glasses and asked Dolores to fire on a few chips. Next time I won’t doubt myself, food is always a good idea!! One of the two girls next up had actually been before, pressure is on now Felipe! Top Tip: use all of your fruit when making cocktails; stick it in the freezer, dry it out, make sugar syrup with it, the possibilities are endless! Now, this was the cocktail that Felipe had promised the girls previously [remember the ones who did not like whiskey and Felipe promised to convert them? Yes them]. Again, no pressure Felipe. The main ingredient is an Irn Bru sugar syrup, Felipe jokes that they recently took all the sugar out of Irn Bru so he was on a mission to put it back in. He passes round the homemade syrup and everyone comments on how thick the syrup is. Felipe explains that he concentrated the mixture down using 4 litres of Irn Bru which has been boiled down to 2 litres, PLUS a whole lot of caster sugar. I think you have successfully managed to get your sugar fix back Felipe! When it came down to the taste test one of the customers commented on the taste of aniseed/star anise and that she really wasn’t fussed, Felipe put this down to the addition of ___ liqueur, good feedback to know as this cocktail would be featuring in the new cocktail menu. Felipe catered for each individual need or want of the customer in attendance. It was an interesting set up because even though everyone took turns at making different cocktails, some giving you serious drink envy, it was actually really informative because you got to see a whole range of cocktails varying from vodka, gin, rum and whiskey. Plus everyone let everyone straw taste test. This is where I think Felipe, and The Ava have a classic twist on their Masterclasses, offering groups the chance to take in more than just the cocktails they make on the night, but everyone else’s as well. It also allows for one-to-one training, banter and an inclusive atmosphere. Felipe was very good at putting people at ease and directing conversation, it took until after the first cocktail was made for everyone to loosen up and get involved but after that conversation flowed and guests were sharing previous cocktail horror stories and experiences. All in all we were extremely happy with how the class went, we received great feedback from participants after they completed a short survey at the end of the class, they all thanked Felipe as they left, leaving with a bit more knowledge and know-how than when they arrived [goal achieved]. We also got some great comments and messages on social media after the event from our guests, thanking us again for a great night. I would just like to take the time to thank every single one of our guests for coming along and being great sports throughout the evening! We hope you enjoyed our most recent blog post. If you would like the recipes for any of the cocktails we made in our masterclass please send us a message/comment with your request and we will do our best to get it up on the blog! Only premium spirits were used throughout the Masterclass; Bacardi, Grey Goose, Bombay Gin, Jameson.